Pulse-code modulation (PCM) is a method used to digitally represent sampled analog signals. It is the standard form of digital audio in computers, compact discs, digital telephony and other digital audio applications. In a PCM stream, the amplitude of the analog signal is sampled regularly at uniform intervals, and each sample is quantized to the nearest value within a range of digital steps. Linear pulse-code modulation (LPCM) is a specific type of PCM where the quantization levels are linearly uniform. This is in contrast to PCM encodings where quantization levels vary as a function of amplitude (as with the A-law algorithm or the μ-law algorithm). Though PCM is a more general term, it is often used to describe data encoded as LPCM. Early electrical communications started to sample signals in order to multiplex samples from multiple telegraphy sources and to convey them over a single telegraph cable. The American inventor Moses G. Farmer conveyed telegraph time-division multiplexing (TDM) as early as 1853. Electrical engineer W. M. Miner, in 1903, used an electro-mechanical commutator for time-division multiplexing multiple telegraph signals; he also applied this technology to telephony. He obtained intelligible speech from channels sampled at a rate above 3500–4300 Hz; lower rates proved unsatisfactory. In 1920, the Bartlane cable picture transmission system used telegraph signaling of characters punched in paper tape to send samples of images quantized to 5 levels. In 1926, Paul M. Rainey of Western Electric patented a facsimile machine which transmitted its signal using 5-bit PCM, encoded by an opto-mechanical analog-to-digital converter. The machine did not go into production. British engineer Alec Reeves, unaware of previous work, conceived the use of PCM for voice communication in 1937 while working for International Telephone and Telegraph in France. He described the theory and advantages, but no practical application resulted. Reeves filed for a French patent in 1938, and his US patent was granted in 1943. By this time Reeves had started working at the Telecommunications Research Establishment. The first transmission of speech by digital techniques, the SIGSALY encryption equipment, conveyed high-level Allied communications during World War II. In 1943 the Bell Labs researchers who designed the SIGSALY system became aware of the use of PCM binary coding as already proposed by Reeves. In 1949, for the Canadian Navy's DATAR system, Ferranti Canada built a working PCM radio system that was able to transmit digitized radar data over long distances. In the United States, the National Inventors Hall of Fame has honored Bernard M. Oliver and Claude Shannon as the inventors of PCM, as described in "Communication System Employing Pulse Code Modulation", U.S. Patent 2,801,281 filed in 1946 and 1952, granted in 1956. Another patent by the same title was filed by John R. Pierce in 1945, and issued in 1948: U.S. Patent 2,437,707. The three of them published "The Philosophy of PCM" in 1948. The T-carrier system, introduced in 1961, uses two twisted-pair transmission lines to carry 24 PCM telephone calls sampled at 8 kHz and 8-bit resolution. This development improved capacity and call quality compared to the previous frequency-division multiplexing schemes. In 1972, Denon unveiled the first 8-channel digital recorder, the DN-023R, which used a 4-head open reel broadcast video tape recorder to record in 47.25 kHz, 13-bit PCM audio. [note 2] In 1977, Denon developed the portable PCM recording system, the DN-034R. Like the DN-023R, it recorded 8 channels at 47.25 kHz, but it used 14-bits "with emphasis, making it equivalent to 15.5 bits." In 1973, adaptive differential pulse-code modulation (ADPCM) was developed, by P. Cummiskey, Nikil Jayant and James L. Flanagan. The compact disc (CD) brought PCM to consumer audio applications with its introduction in 1982. The CD uses a 44,100 Hz sampling frequency and 16-bit resolution and stores up to 80 minutes of stereo audio per disc. The 4ESS switch introduced time-division switching into the US telephone system in 1976, based on medium scale integrated circuit technology. LPCM is used for the lossless encoding of audio data in the Compact disc Red Book standard (informally also known as Audio CD), introduced in 1982. AES3 (specified in 1985, upon which S/PDIF is based) is a particular format using LPCM. LaserDiscs with digital sound have an LPCM track on the digital channel. On PCs, PCM and LPCM often refer to the format used in WAV (defined in 1991) and AIFF audio container formats (defined in 1988). LPCM data may also be stored in other formats such as AU, raw audio format (header-less file) and various multimedia container formats. LPCM has been defined as a part of the DVD (since 1995) and Blu-ray (since 2006) standards. It is also defined as a part of various digital video and audio storage formats (e.g. DV since 1995, AVCHD since 2006). LPCM is used by HDMI (defined in 2002), a single-cable digital audio/video connector interface for transmitting uncompressed digital data. RF64 container format (defined in 2007) uses LPCM and also allows non-PCM bitstream storage: various compression formats contained in the RF64 file as data bursts (Dolby E, Dolby AC3, DTS, MPEG-1/MPEG-2 Audio) can be "disguised" as PCM linear. In the diagram, a sine wave (red curve) is sampled and quantized for PCM. 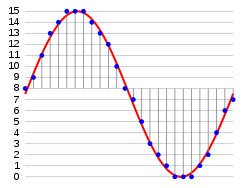 The sine wave is sampled at regular intervals, shown as vertical lines. For each sample, one of the available values (on the y-axis) is chosen. The PCM process is commonly implemented on a single integrated circuit called an analog-to-digital converter (ADC). This produces a fully discrete representation of the input signal (blue points) that can be easily encoded as digital data for storage or manipulation. Several PCM streams could also be multiplexed into a larger aggregate data stream, generally for transmission of multiple streams over a single physical link. One technique is called time-division multiplexing (TDM) and is widely used, notably in the modern public telephone system. The electronics involved in producing an accurate analog signal from the discrete data are similar to those used for generating the digital signal. These devices are digital-to-analog converters (DACs). They produce a voltage or current (depending on type) that represents the value presented on their digital inputs. This output would then generally be filtered and amplified for use. Common sample depths for LPCM are 8, 16, 20 or 24 bits per sample. LPCM encodes a single sound channel. Support for multichannel audio depends on file format and relies on synchronization of multiple LPCM streams. While two channels (stereo) is the most common format, systems can support up to 8 audio channels (7.1 surround) or more. Common sampling frequencies are 48 kHz as used with DVD format videos, or 44.1 kHz as used in Compact discs. Sampling frequencies of 96 kHz or 192 kHz can be used on some equipment, but the benefits have been debated. The Nyquist–Shannon sampling theorem shows PCM devices can operate without introducing distortions within their designed frequency bands if they provide a sampling frequency at least twice that of the highest frequency contained in the input signal. For example, in telephony, the usable voice frequency band ranges from approximately 300 Hz to 3400 Hz. For effective reconstruction of the voice signal, telephony applications therefore typically uses an 8000 Hz sampling frequency which is more than twice the highest usable voice frequency. Between samples no measurement of the signal is made; the sampling theorem guarantees non-ambiguous representation and recovery of the signal only if it has no energy at frequency fs/2 or higher (one half the sampling frequency, known as the Nyquist frequency); higher frequencies will not be correctly represented or recovered and add aliasing distortion to the signal below the Nyquist frequency. Linear PCM (LPCM) is PCM with linear quantization. In telephony, a standard audio signal for a single phone call is encoded as 8,000 analog samples per second, of 8 bits each, giving a 64 kbit/s digital signal known as DS0. The default signal compression encoding on a DS0 is either μ-law (mu-law) PCM (North America and Japan) or A-law PCM (Europe and most of the rest of the world). These are logarithmic compression systems where a 12 or 13-bit linear PCM sample number is mapped into an 8-bit value. This system is described by international standard G.711. An alternative proposal for a floating point representation, with 5-bit mantissa and 3-bit exponent, was abandoned. PCM can be either return-to-zero (RZ) or non-return-to-zero (NRZ). For a NRZ system to be synchronized using in-band information, there must not be long sequences of identical symbols, such as ones or zeroes. For binary PCM systems, the density of 1-symbols is called ones-density. The word pulse in the term pulse-code modulation refers to the "pulses" to be found in the transmission line. This perhaps is a natural consequence of this technique having evolved alongside two analog methods, pulse width modulation and pulse position modulation, in which the information to be encoded is represented by discrete signal pulses of varying width or position, respectively. In this respect, PCM bears little resemblance to these other forms of signal encoding, except that all can be used in time division multiplexing, and the numbers of the PCM codes are represented as electrical pulses. The device that performs the coding and decoding function in a telephone (or other circuit) is called a codec. ^ Among the first recordings was Uzu: The World Of Stomu Yamash'ta 2 by Stomu Yamashta. ^ The first recording with this new system was recorded in Tokyo during April 24–26, 1972. ^ Other methods exist such as pulse-density modulation used also on Super Audio CD. ^ Some systems use digital filtering to remove some of the aliasing, converting the signal from digital to analog at a higher sample rate such that the analog anti-aliasing filter is much simpler. In some systems, no explicit filtering is done at all; as it's impossible for any system to reproduce a signal with infinite bandwidth, inherent losses in the system compensate for the artifacts — or the system simply does not require much precision. ^ Quantization error swings between -q/2 and q/2. In the ideal case (with a fully linear ADC and signal level >> q) it is uniformly distributed over this interval, with zero mean and variance of q2/12. ^ A slight difference between the encoding and decoding clock frequencies is not generally a major concern; a small constant error is not noticeable. Clock error does become a major issue if the clock contains significant jitter, however. ^ a b c Alvestrand, Harald Tveit; Salsman, James (May 1999). "RFC 2586 – The Audio/L16 MIME content type". The Internet Society. Retrieved March 16, 2010. ^ a b c Casner, S. (March 2007). "RFC 4856 – Media Type Registration of Payload Formats in the RTP Profile for Audio and Video Conferences – Registration of Media Type audio/L8". The IETF Trust. Retrieved March 16, 2010. ^ a b c d Bormann, C.; Casner, S.; Kobayashi, K.; Ogawa, A. (January 2002). "RFC 3190 – RTP Payload Format for 12-bit DAT Audio and 20- and 24-bit Linear Sampled Audio". The Internet Society. Retrieved March 16, 2010. ^ "Audio Media Types". Internet Assigned Numbers Authority. Retrieved March 16, 2010. ^ a b "Linear Pulse Code Modulated Audio (LPCM)". Library of Congress. February 19, 2008. Retrieved March 21, 2010. ^ "The Bartlane Transmission System". DigicamHistory.com. Archived from the original on February 10, 2010. Retrieved January 7, 2010. ^ U.S. patent number 1,608,527; also see p. 8, Data conversion handbook, Walter Allan Kester, ed., Newnes, 2005, ISBN 0-7506-7841-0. ^ Sears, R. W. (January 1948). Electron Beam Deflection Tube for Pulse Code Modulation. Bell Systems Technical Journal. 27. Bell Labs. pp. 44–57. Retrieved May 14, 2017. ^ Goodall, W. M. (January 1951). Television by Pulse Code Modulation. Bell Systems Technical Journal. 30. Bell Labs. pp. 33–49. Retrieved May 14, 2017. ^ "Bernard Oliver". National Inventor's Hall of Fame. Archived from the original on December 5, 2010. Retrieved February 6, 2011. ^ "Claude Shannon". National Inventor's Hall of Fame. Archived from the original on December 6, 2010. Retrieved February 6, 2011. ^ "National Inventors Hall of Fame announces 2004 class of inventors". Science Blog. February 11, 2004. Retrieved February 6, 2011. ^ B. M. Oliver; J. R. Pierce & C. E. Shannon (November 1948). "The Philosophy of PCM". Proceedings of the IRE. 36 (11): 1324–1331. doi:10.1109/JRPROC.1948.231941. ISSN 0096-8390. ^ a b c Thomas Fine (2008). "The dawn of commercial digital recording" (PDF). ARSC Journal. 39 (1): 1–17. ^ P. Cummiskey, N. S. Jayant, and J. L. Flanagan, "Adaptive quantization in differential PCM coding of speech," Bell Syst. Tech. J., vol. 52, pp. 1105—1118, Sept. 1973. ^ Cambron, G. Keith (October 17, 2012). Global Networks: Engineering, Operations and Design. John Wiley & Sons. p. 345. ^ "DVD Technical Notes (DVD Video – "Book B") – Audio data specifications". July 21, 1996. Retrieved March 16, 2010. ^ Jim Taylor. "DVD Frequently Asked Questions (and Answers) – Audio details of DVD-Video". Retrieved March 20, 2010. ^ "How DV works". Archived from the original on December 6, 2007. Retrieved March 21, 2010. ^ "AVCHD Information Website – AVCHD format specification overview". Retrieved March 21, 2010. ^ "RFC 3108 – Conventions for the use of the Session Description Protocol (SDP) for ATM Bearer Connections". May 2001. Retrieved March 16, 2010. ^ "PCM, Pulse Code Modulated Audio". Library of Congress. Retrieved July 18, 2009. ^ "24/192 Music Downloads, and why they do not make sense". Chris "Monty" Montgomery. Retrieved March 16, 2013. ^ "Linear Pulse Code Modulated Audio (LPCM)". The Library of Congress. February 19, 2008. Retrieved March 21, 2010. Franklin S. Cooper; Ignatius Mattingly (1969). "Computer-controlled PCM system for investigation of dichotic speech perception". Journal of the Acoustical Society of America. 46: 115. doi:10.1121/1.1972688. Ken C. Pohlmann (1985). Principles of Digital Audio (2nd ed.). Carmel, Indiana: Sams/Prentice-Hall Computer Publishing. ISBN 978-0-672-22634-2. Bill Waggener (1995). Pulse Code Modulation Techniques (1st ed.). New York, NY: Van Nostrand Reinhold. ISBN 978-0-442-01436-0. Bill Waggener (1999). Pulse Code Modulation Systems Design (1st ed.). Boston, MA: Artech House. ISBN 978-0-89006-776-5. Summary of LPCM – Contains links to information about implementations and their specifications. How to control internal/external hardware using Microsoft's Media Control Interface – Contains information about, and specifications for the implementation of LPCM used in WAV files.